Gooding will offer an Aston Martin DB II, a DB5 Vantage and a Lancia Aurelia B24S Spider America at its Amelia Island 2017 classic car auction in Florida. 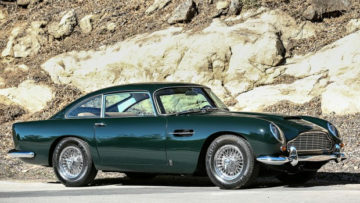 A 1949 Aston Martin DB Mk II, a 1965 Aston Martin DB5 Vantage and a 1955 Lancia Aurelia B24S Spider America are the latest top sports cars announced for the Gooding Amelia Island 2017 classic car sale in Florida, USA, in mid-March. The Mark II Aston Martin, based on the Le Mans-participating cars, was the personal car of David Brown and contributed to the development of the DB2 road cars. The 1965 Aston Martin DB5 Vantage is one of only ten produced with factory left-hand drive and air-conditioning. The 1955 Lancia Aurelia B24S Spider America is believed to be the second oldest survivor of the model. 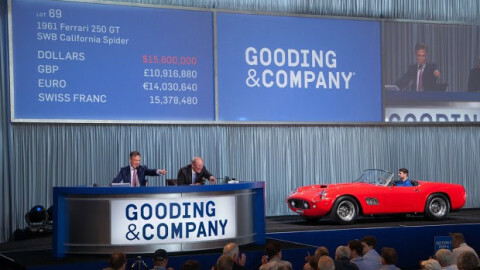 Gooding announced two Aston Martins with estimates well above a million dollar for sale at the Amelia Island auction in March 2017. Aston Martins have been selling well at recent auctions. At Scottsdale, Arizona, 2017, two DB5s sold in excess of a million dollar – the first time in two years that standard models broke the million-dollar mark. 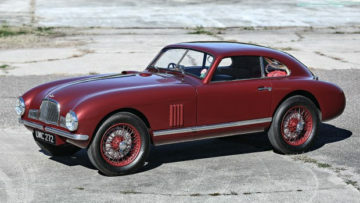 Two pre-war Aston Martins are on offer at Bonhams in Paris while RM Sotheby’s sold the 2012 Aston Martin V12 Zagata “No. 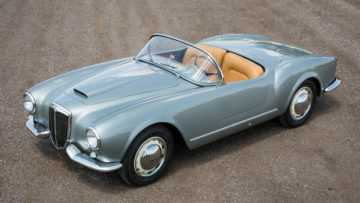 Zero” at the Rétromobile week sale in Paris in February 2017 for near a million. The 1949 Aston Martin DB Mk II, chassis LML/49/4, (estimate: $1,500,000-$2,250,000) is an integral piece of Aston Martin history – it was the personal car of David Brown. David Brown purchased Aston Martin and Lagonda in 1947, and he immediately formed a works racing team within the company. That team developed three new Aston Martins (Chassis LMA/49/1, LMA/49/2, and LML/49/3) to compete in the first postwar 24 Hours of Le Mans, held in June 1949. Brown had a fourth example built for his personal use, which is the car presented here, chassis LML/49/4. This car, served as David Brown’s personal transport and, through extensive testing, contributed to the development of the production Aston Martin DB2. After Brown, LML/49/4 was owned by famous factory racing driver Lance Macklin. Macklin further developed the car and campaigned it with works support at two of the most celebrated Italian sports car races of the postwar era, the 1950 Coppa Inter-Europa and the 1950 Targa Florio. Beautifully restored by Aston Martin Works Service, it has since been presented at world-renowned concours and events, including the 2010 Mille Miglia Storica, the 2015 Pebble Beach Concours d’Elegance®, and the 2016 Windsor Castle Concours d’Elegance. For the collector with an admiration for fine English sports cars or the true devotee of David Brown-era Aston Martins, the presentation of this historic automobile at auction represents a once-in-a-lifetime opportunity. The 1965 Aston Martin DB5 Vantage, chassis DB5/2211/L, (estimate: $1,300,000-$1,500,000) is one of only 65 Vantage models built. The legendary Aston Martin DB5 debuted in 1963 and became a Hollywood icon in the 1964 James Bond film, Goldfinger. Shortly after, the company introduced the DB5 Vantage variant, which debuted a modified V8 that produced 314bhp. This 1965 Aston Martin DB5 Vantage, chassis DB5/2211/L, is one of just 10 original factory left-hand drive Vantage examples with factory air-conditioning. Presented in a timeless color combination of Goodwood Green over tan Connolly leather hides, DB5/2211/L is one of the most elegant and beautiful Vantages in existence. Ready to drive or show with pride, this superb Aston Martin has benefitted from a ground-up restoration in 2002 by a marque specialist and presents the rare opportunity to own an immaculate and striking example of one the most iconic sports cars. The 1955 Lancia Aurelia B24S Spider America (estimate: $1,600,000-$1,800,000) is as beautiful as it is fast. With masterfully styled coachwork by Pinin Farina and a top speed of 115 mph, it’s easy to see why the Spider America has always been lauded by Lancia enthusiasts and knowledgeable collectors. This remarkable Spider America, chassis 1009, is one of just 181 left-hand-drive B24S Spider Americas ever built and is believed to be the second-oldest surviving example of the model. The Lancia has had very few owners since new and was in the loving care of a single family for nearly three decades. In 2014, chassis 1009 received an show-quality restoration and was finished in the factory color of Grigio Newmarket, while the interior was reupholstered in correct Vaumol leather. That restoration earned the car Best of Show at the Colorado Concours d’Elegance in June 2014. This award-winning car retains its matching-numbers engine, is accompanied by a factory chassis log and build record, and is among the finest examples of Lancia’s most desirable road-going sports car. Lancia Aurelia B24S Spider Americas usually sell for between one and two million dollar. Worldwide Auctions sold one for $1.1 million at Scottsdale 2017 while Artcurial is offering one in Paris with a similar estimate. Spider Americas demand a considerable premium over the standard Lancia Aurelia B24S cabriolet – Bonhams is expecting less than half a million for a cabriolet with hardtop on offer in Paris.